It’s the end of 2012 and I’m reflecting on the past year. Not to sound too down but there has been a lot of loss and sadness everywhere and it makes me more thankful than ever to be where I am and hold those I love more dear. Since the Winter Solstice the days are at last getting just a little bit longer. The garden is fast asleep with nothing growing except my garlic that I planted in November. There has been so much rain I have come to realize that my garden doesn’t get enough sun and so my son James has been liming up some of the tall redwood trees to the South. Hope this helps but we might have to cut some trees in the future. 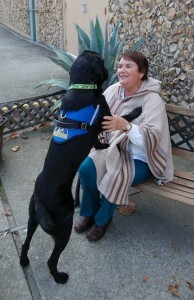 This last September the puppy I was raising for Canine Companions (Judge) graduated and lives in Seattle as a companion to someone who takes him to work daily so he can assist her in her daily life. He was a wonderful dog and I miss him a lot but he is fulfilling his destiny with her and I’m proud and happy for him. He is the third pup I raised for CCI. I still have Sage who I raised and was a breeder caretaker for her five litters ( 38 pups). She has been retired since 2005 and is my companion now. This entry was posted in Daily Life by Mendocino Farm House. Bookmark the permalink. March is here and Spring has sprung!